posting (so it is fresh). Checking it a few mentions of the right type of keywords and phrases. Making sure the URL contains keywords. Talent Acquisition teams are busy, so this might not seem like the most important task on your hiring checklist. Mmm. Textio has given this posting a score of zero! It has pointed out the good points and the bad points on the left hand side (along with suggestions) so that I can start making amendments. Some of it is basic formatting (the copy and paste has not copied over the bullet points, for example) but most is language based. So I’m now going to make some amendments and see if I can get my ‘Textio Score’ up quickly. Adding bullet points quickly increases my score to 28. But not too many – that then takes my score back down again. I add in some information about the business into my first paragraph. This takes my score up to 42. 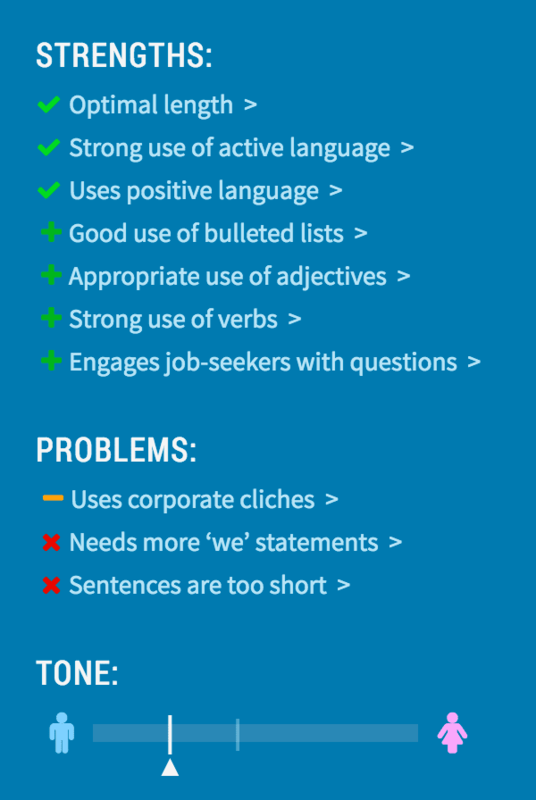 Correcting a spelling error reduces my score to 41 – so some work to do there, Textio. Adding specific industries increases my score to 49 (because, I’m assuming, it is making the posting more ‘searchable’). Providing more keywords about the role, and increasing the length, increases my score to 69. 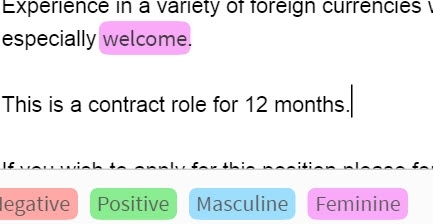 I add the word ‘welcome’ – and Textio tells me (by highlighting the word) that based on data, this will possibly increase the number of applications that I receive from women. It does this a number of other times (and for non-gender related reasons) with things like direct phrases. I then add a bit more information. Textio encourage ‘We’ statements – it adds a bit of warmth to the positing. So I include information about mission, and the benefits package that the client offers. This increases my score to 97! Fantastic! Textio encourages me to add in an equal opportunities statement. So I do this, and it brings my score down to 96. So I then delete it, and it takes my score down to 90 despite the text being identical to that that scored 97. So I’ve spent about five minutes making changes to an add that was really bare, and it has taken my ‘score’ up to 90. When I read back the before and after postings, it is without a doubt better. So does Textio seem useful? 100%. It is difficult to critically review your own recruitment adverts (especially when short on time). It is in very early better and the scoring systems needs some work. 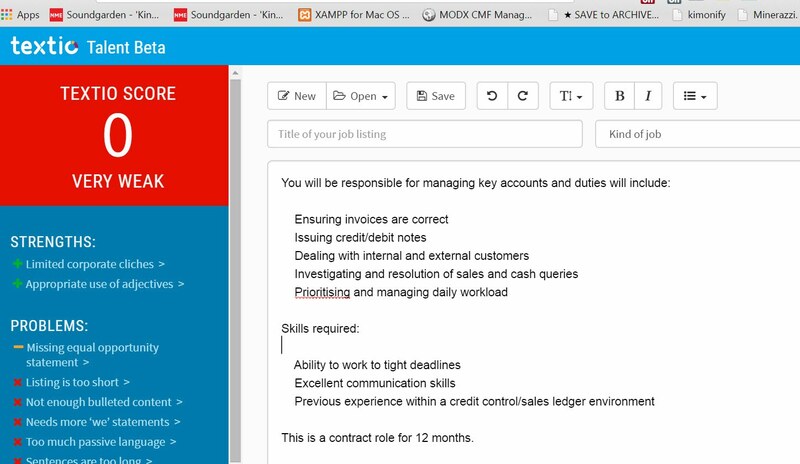 But it provides a very quick method to create an effective job posting. Definitely worth a try!